Remus Memorial Horse Sanctuary hasn't added a story. He is such a happy little pony, very vocal and like a lot of metabolic syndrome ponies, is driven by food!!! For some time we noticed his breath smelling quite badly and on an examination by our vet a Diastema was found. (Diastema is a gap between two teeth that allows food to build up. As the food rots down it causes infection in the gap, known as periodontal disease). When the food in this was cleared a small piece of wood was found in the gap and following veterinary examinations we have found that the wood has gone through his gum piercing his nostril. Having endoscoped his nostril it is clear that this piece of wood has been there for a long time causing massive distortion to his nostril. It is not easy to extract a horses tooth due to their design and the roots being deep set so poor Sparkey had to go through three sessions under sedation to finally be able to remove the tooth! Dear little Sparkey has been through so much and yet we don’t know how this is going to turn out but he has remained his usual cheery self and within minutes of the sedation wearing off he’s back to himself and calling for company and food! He is only 12yrs old so we want to give him every chance possible but this of course has already cost veterinary care into thousands of pounds with more vet visits and possibly surgery to sort out. 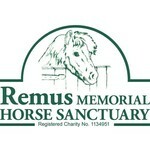 Remus Memorial Horse Sanctuary hasn't posted any updates yet. Remus Memorial Horse Sanctuary is managing the funds for this campaign.